A Day in the Life | Random musings on the passing scene. Random musings on the passing scene. 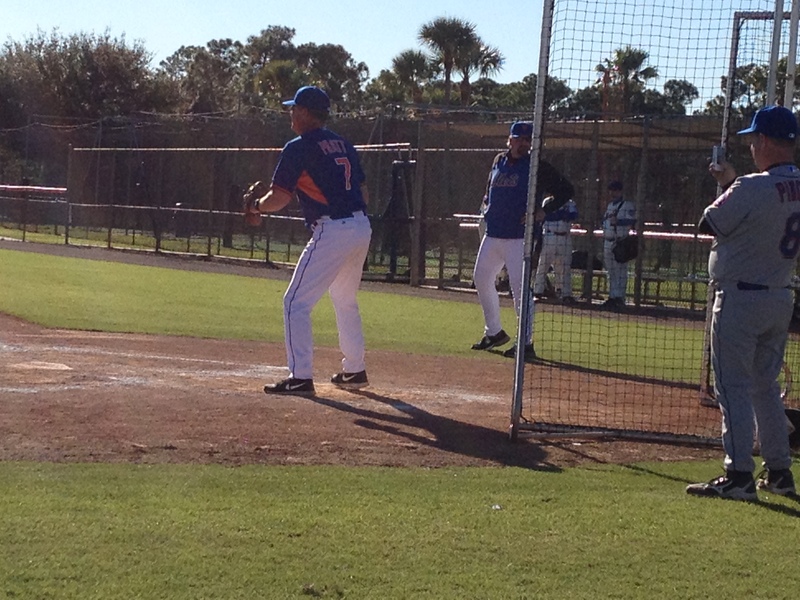 This year’s Fantasy Camp was held in Port St. Lucie from Tuesday, January 14 through Sunday, January 19. 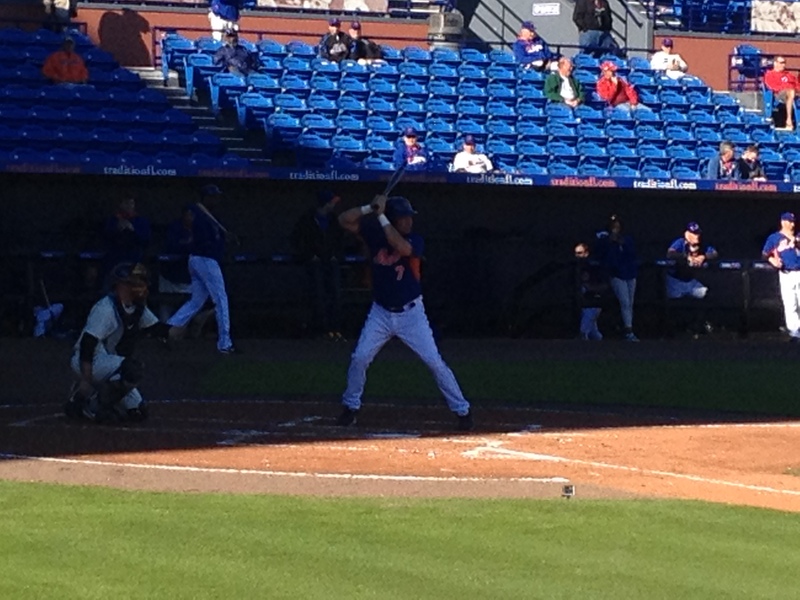 My friends Baboo and Metswinagain were both in attendance. 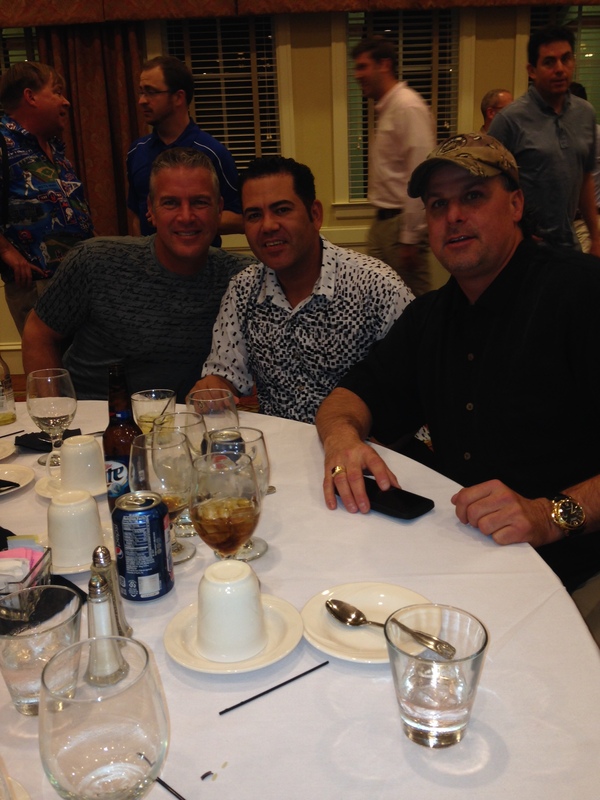 Baboo flew down from NY, Metswinagain came in from the UK and I drove in from the Gulf Coast. 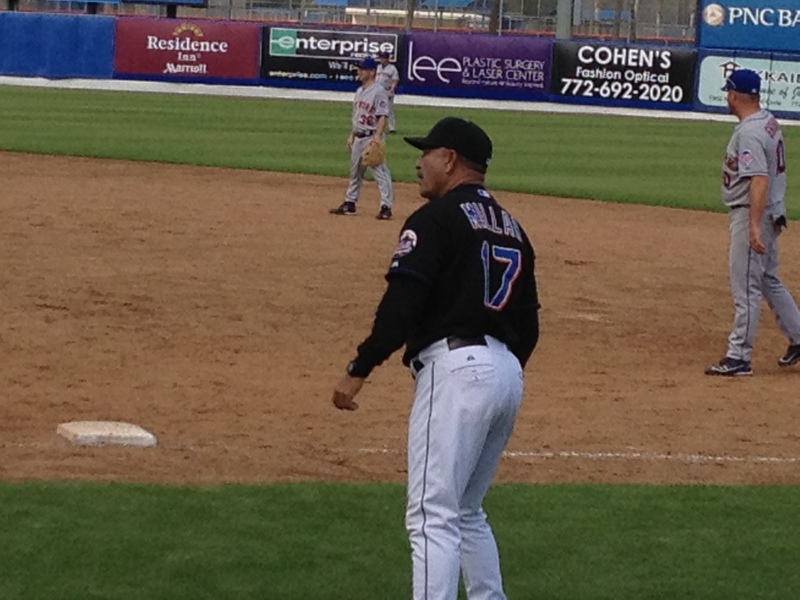 The coaching staff had a lot of familiar names: John “Dude” Stearns (aka Commissioner for Life), Duffy Dyer, Bobby Wine, Doug Flynn, Joe Pignatano, Al Jackson, Wally Backman, Lenny Harris, Randy Neimann, Turk Wendell (he returned after a 1-year absence), Dwight Gooden, etc. 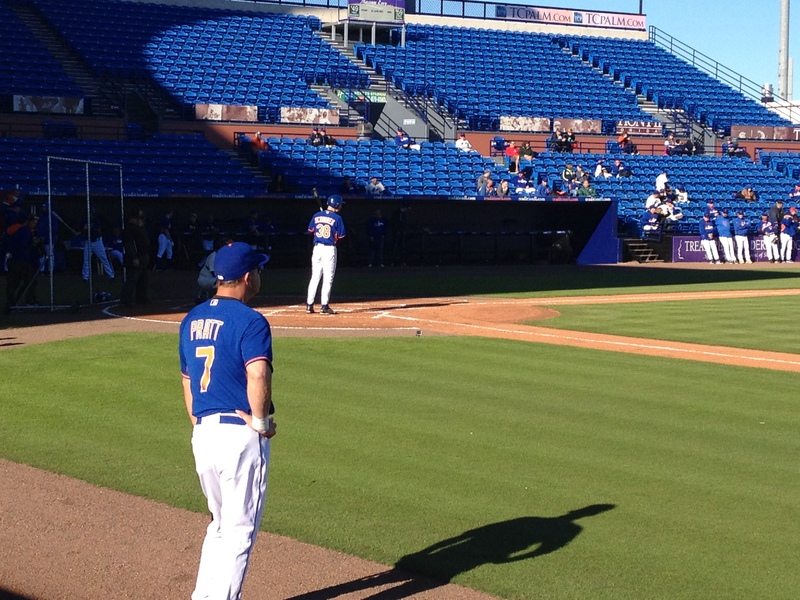 Two very popular former Mets made their Fantasy Camp debuts: Edgardo Alfonzo and Todd Pratt. 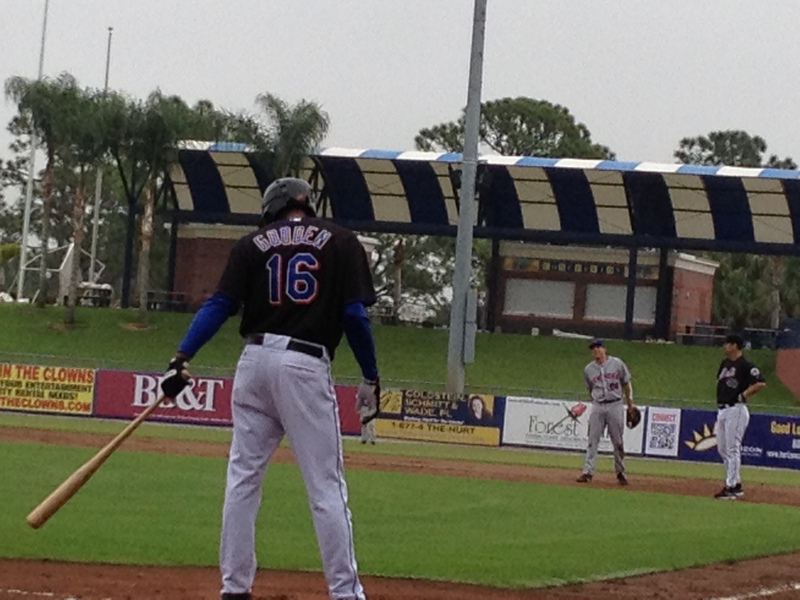 For long-time Mets’ fans, these 2 names bring back a lot of good memories from the teams from the 1999 and 2000 seasons. 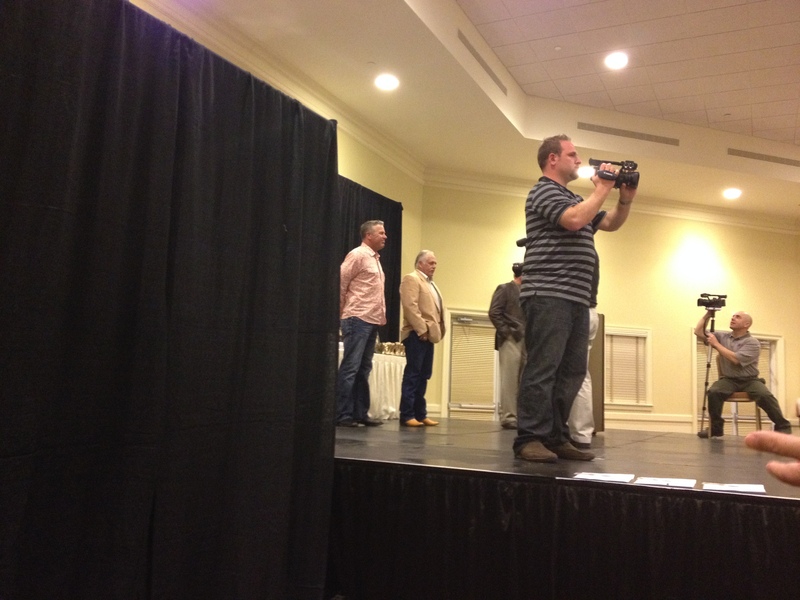 Bud Harrelson was absent for the 2nd year in a row, and Ed Charles was, apparently, ill and unable to attend. Get well soon, Glider. You were missed. As always, click on the pictures to enlarge them. 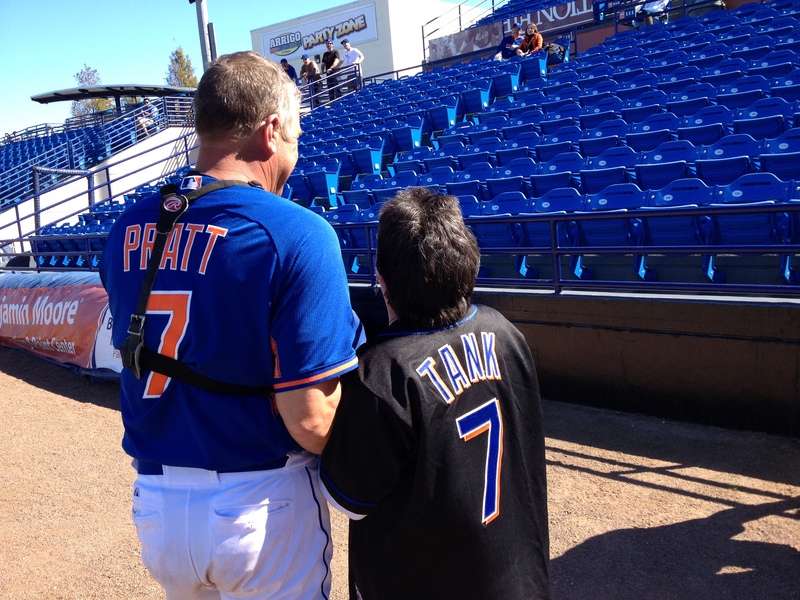 Wally Backman and Tank were the coaches for Baboo and Metswinagain’s team, the Pratt Fallers. Unfortunately, the PF’s didn’t win a single game, but they had a fun team with a lot of good people. In fact, several players from higher-ranked teams said that they would have loved to have played for this team because they’d had so much fun. Something very special did happen at this camp. For the first time in recent memory, a group of campers beat the pros. The players celebrated on the field as if they’d won the World Series which, considering the situation, is pretty much exactly what they did. The fans in the stands knew what was happening and we were just as excited. It was pretty darned cool. This is a photo Baboo sent me from Tuesday’s Welcome Dinner. It features 3 of my favorite players from the 2000 NL Championship team. 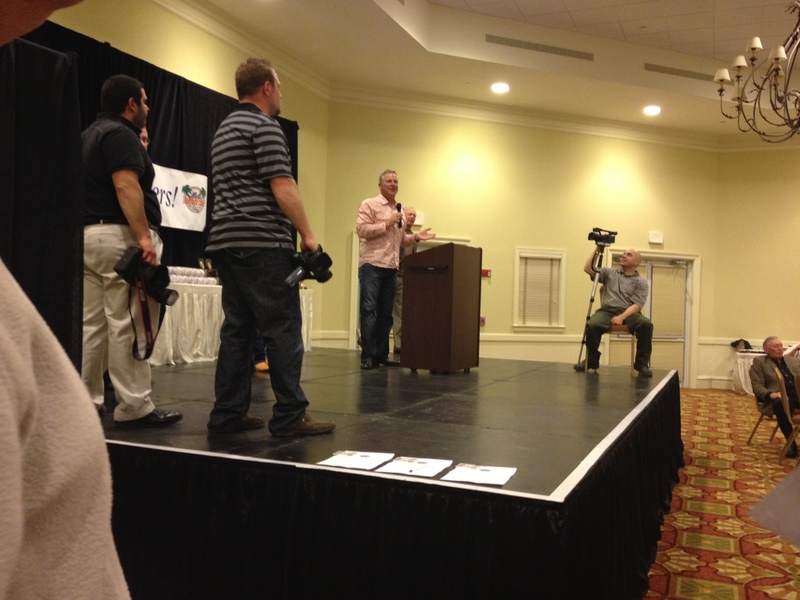 I got to see Tank’s ring at the awards dinner. It’s very, very cool. Coach Pratt works with his pitcher. 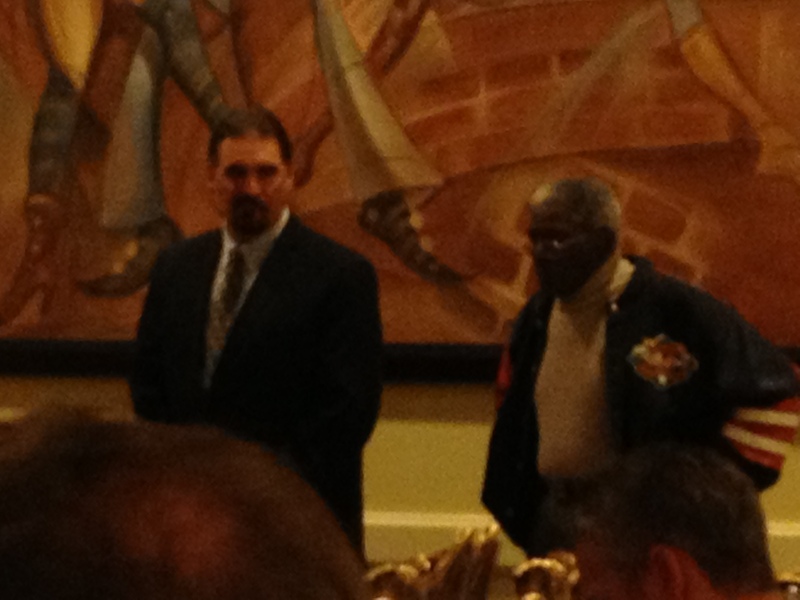 Tank and Wally honor the Pratt Fallers. Fonzie and Kevin Baez in the crowd. 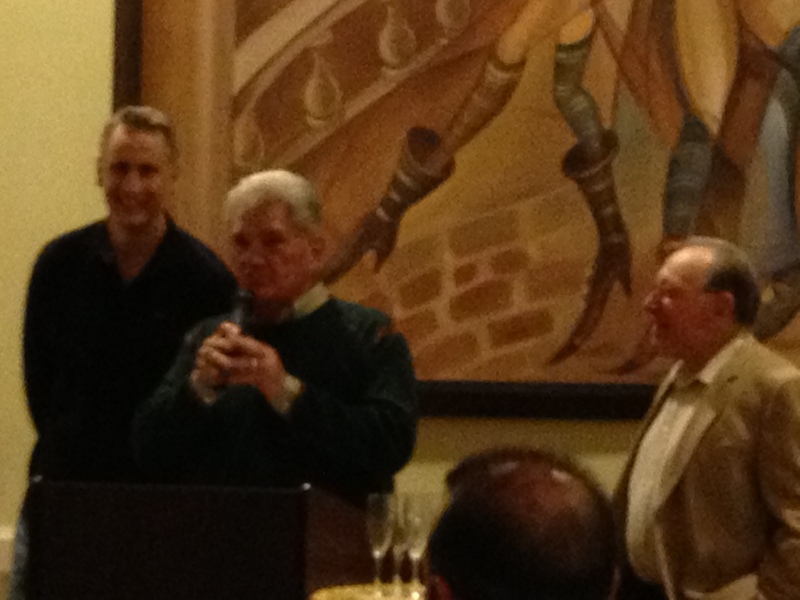 Piggy, Doug Flynn and Bobby Wine honor their team’s MVP. 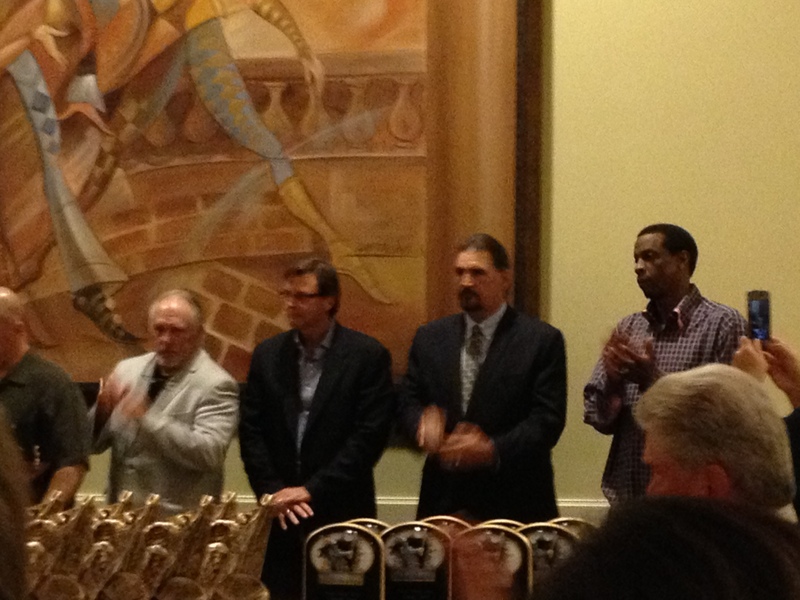 Doc Gooden gives out the Tom Seaver award. 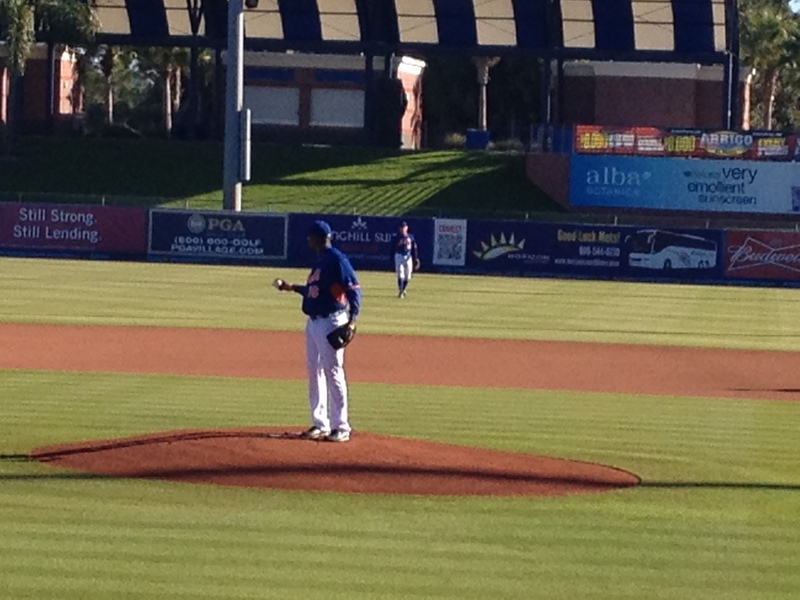 Doc Gooden on the mound. Doc started Game 1 (against the top-place team) and gave up 2 runs in the first. He found his groove soon afterwards, and the coaches won the game. Doc pitched the first couple of games. 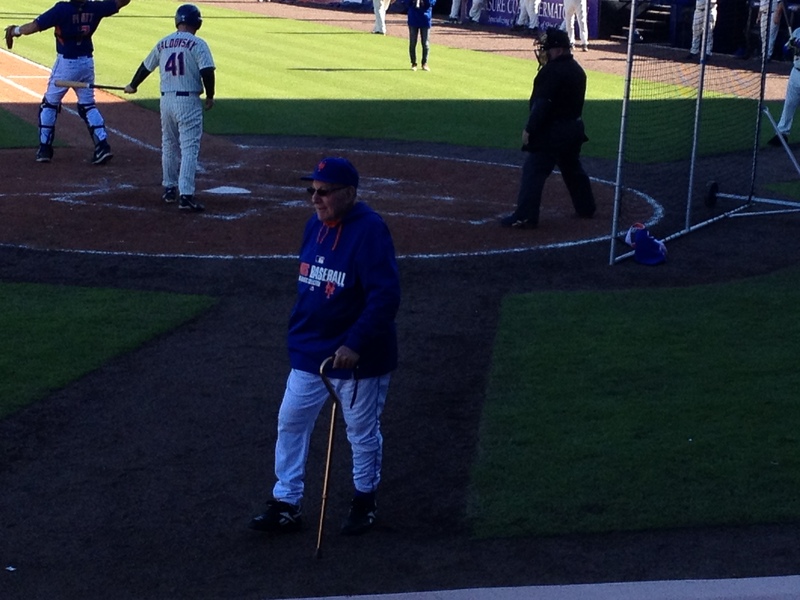 Doc was also pretty incredible at the plate. I know he made an out over the course of the 8 games, but I don’t remember seeing it. Turk had a bunch of at bats and got several hits. Who said pitchers can’t hit??? It looks to me as if Guy doesn’t think Turk’s going to run. 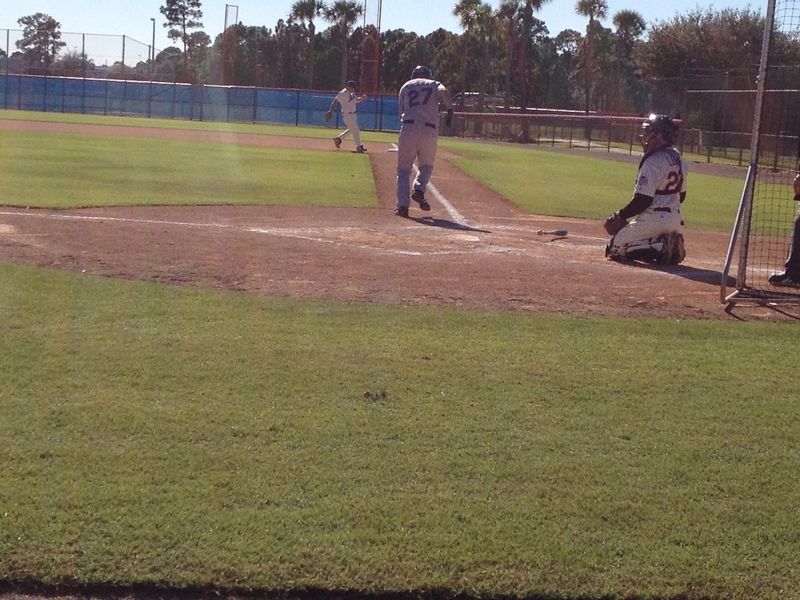 Schourek at the plate with Tank on deck. 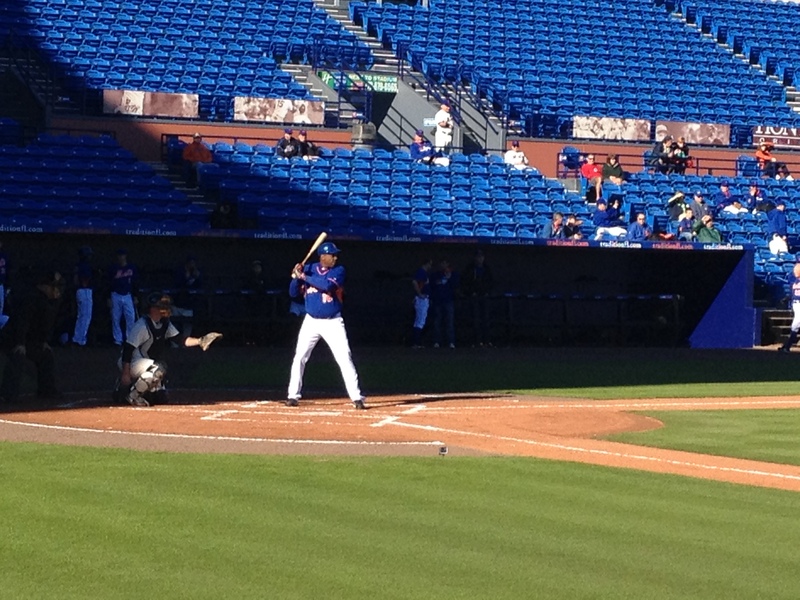 Tank takes his turn at bat. SS Turk and 3B Fonzie. 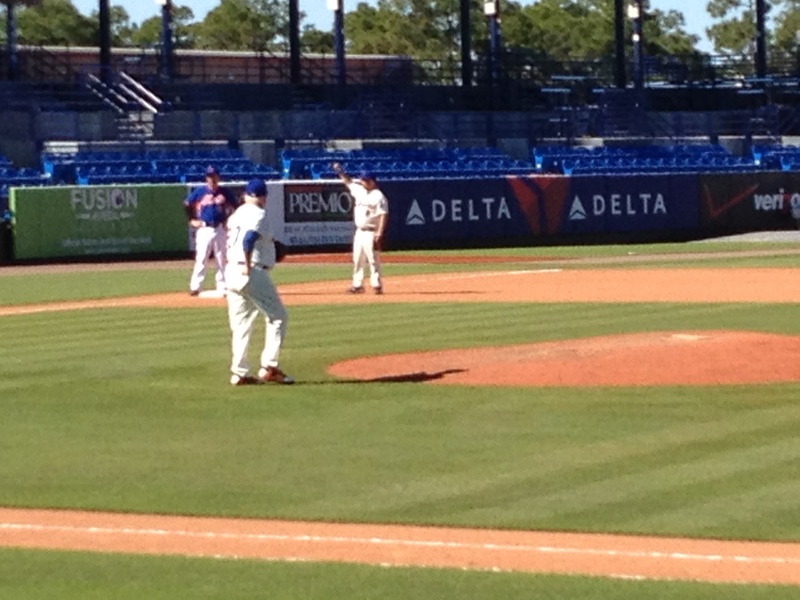 Turk did pitch on Sunday, but he also played short. 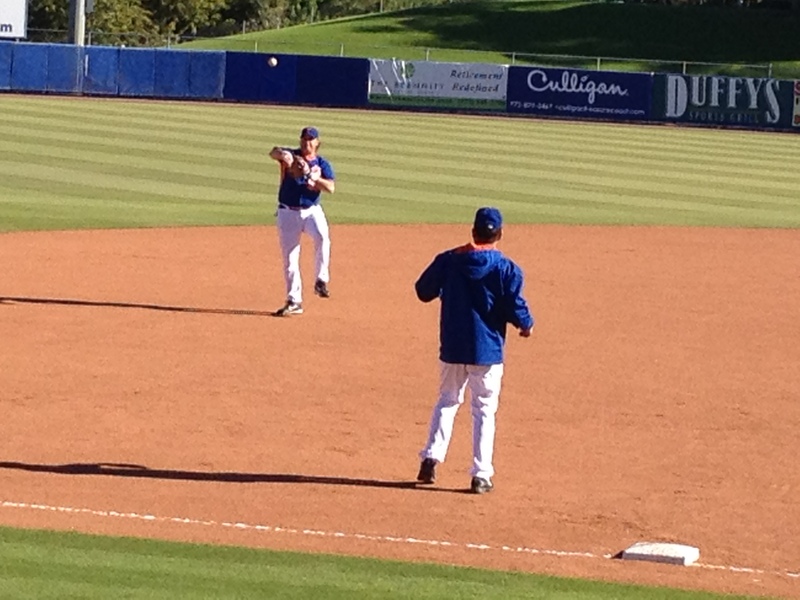 Here he is, playing catch with 3B Alfonzo. It breaks my heart that this was in the shade and is so hard to see. 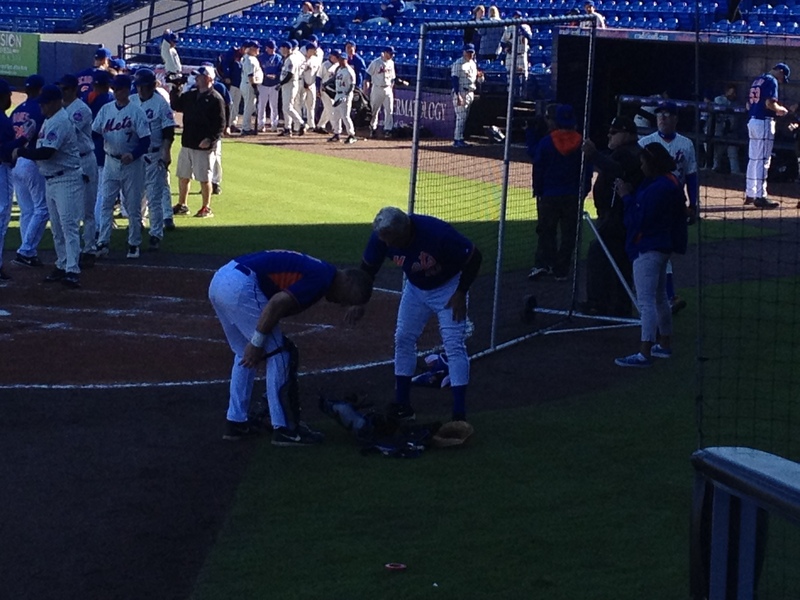 But this is Tank (2000 WS Met) and Duffy Dyer (1969 WS Met) changing places. Duffy caught the first 2 games, and Tank caught the rest. Joe Pignatano doesn’t play in the games, but he’s still a presence on the sidelines. He’s a true gentleman, and I’m so happy I’ve gotten to spend time with him over the years. Lots of coaches were out of position. 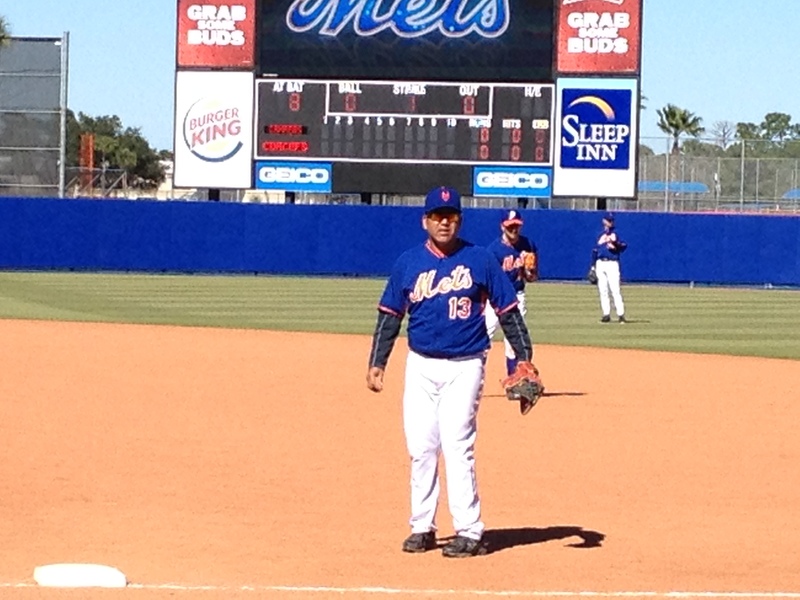 I honestly cannot remember seeing Fonzie play first base. 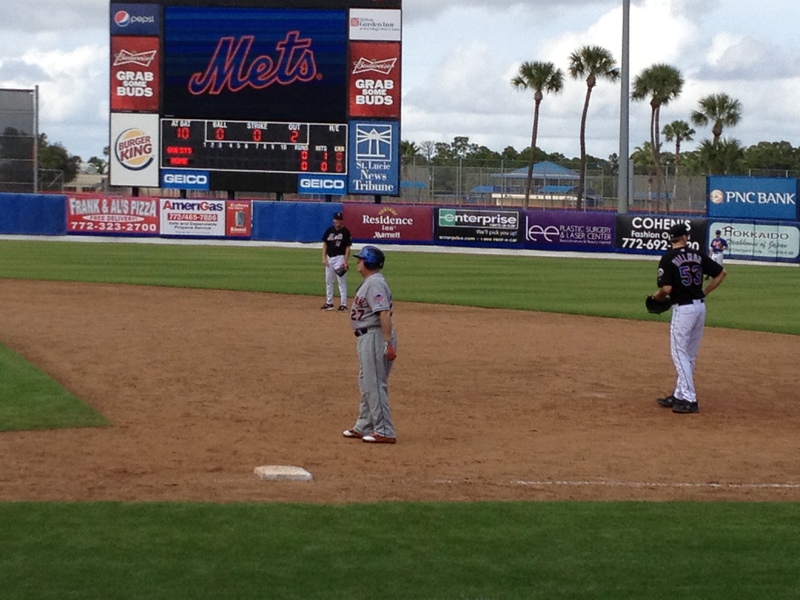 Metswinagain gets to first against the coaches in Sunday’s game. 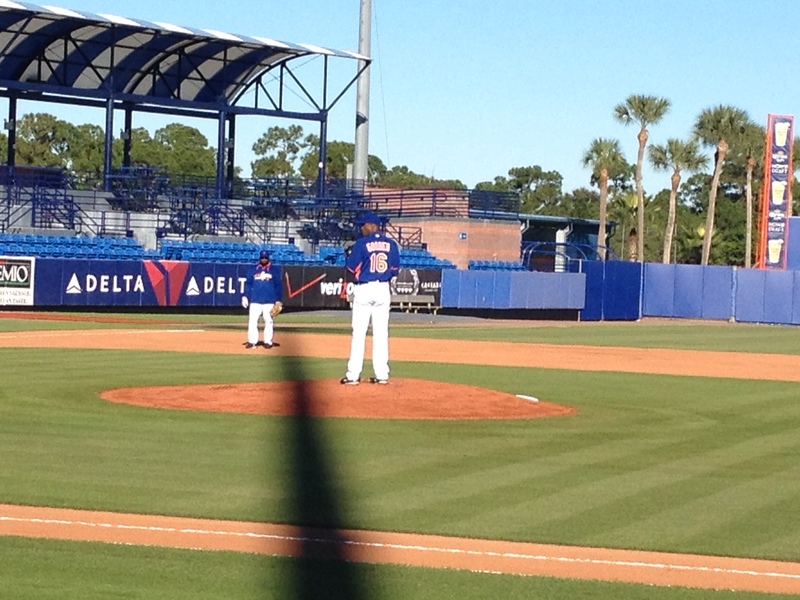 Baboo takes the mound in Game 8. And here is a picture of Tank and me. Right after he was traded to the Phillies in 2001, I went to a sporting good store and found a jersey that said “Tank” instead of Pratt. Obviously, we should have swapped places, but we didn’t think of it. 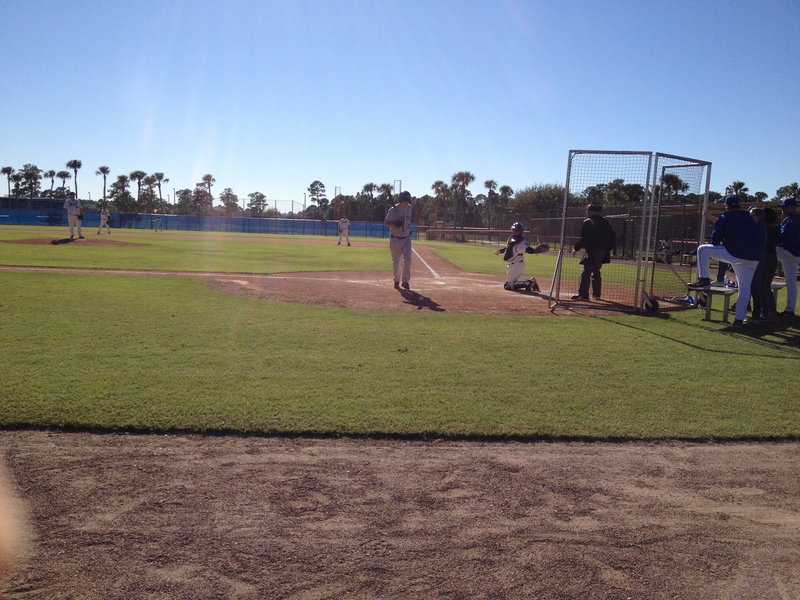 So, Fantasy Camp 2014 is over, but I’m already looking forward to heading East to PSL in 2015. I’ll repeat what I’ve said before; if you are in the PSL area in the days before MLK weekend, you should visit the camp. The tournament games are open to the public, as are the campers/coaches game on Sunday. You will not regret it. For decades, my mother has been nagging me to read Celia Garth, by Gwen Bristow. The book was published in 1959, making it just about the same age I am. I’m not sure why I never got around to reading it, but now I could kick myself for not having read it when Mom first mentioned it. In short, I loved it. We meet Celia herself right away. She is a 20-year-old orphan who is working as an apprentice seamstress for the best dressmaker in Charleston, South Carolina. The year is 1779, and the American Revolution has been going on for several years. Celia really doesn’t care one way or the other about the war; all she cares about is having some excitement in her life. But circumstances draw her in, and soon she cares very, very much about the war and the participants. She gets engaged to a rebel captain, she becomes a spy for the rebel cause and, along the way, she and the people she cares about face real danger and real sorrow. As has been said, “War is Hell,” and young Celia learns this first hand. Real historical figures play important roles in the story; we get to meet Francis Marion (the “Swamp Fox”), and we learn about the King’s commanders Cornwallis, Clinton, Tarleton, etc. At first, I found Celia a little annoying, but I guess a lot of 20-year-olds are, and she did grow on me. I loved the supporting characters as much as Celia does, and felt her joy and her pain as her world went all topsy-turvy around her. Celia grows up because of her experiences, and I am glad I got to go along for the ride. I cannot recommend this book enough for anyone who likes a good historical novel with lots of romance and action. It’s just wonderful and it’s a book I can see myself reading again over the years. OK, now for the reason I’ve been away so long. I took the plunge and became a homeowner. Neither side used a realtor, so I got a crash course in home buying and it consumed so much of my time and emotional energy (and cash!) that I didn’t have enough to spare for reading, stitching, movie-going, blogging, etc. But now I’m settled in and am getting used to living on my own again. No parents, no dogs, no “partners-in-crime” just across the street or down the block. It’s very quiet, but I am remembering how much I like quiet when I’m not at work (odd for a City Mouse, but true). In my 100+ year-old NYC apartment building, the walls were so thin that I could practically hear my neighbors boiling water (and we all heard things we wish we hadn’t!). But this is a 7-year-old building made out of cinder block, so I hardly know I even have neighbors now. I still need a ton of stuff — book cases, living room couch, coffee table, etc. I had “issues” with the washing machine, and the ice maker that I bought in December to go with the refrigerator I bought at the same time was just delivered and installed this morning. The guest room still has a lot of boxes, but the living room and dining room are looking good. My handyman will be back next weekend to help out with some stuff I can’t do myself, and the “official” housewarming is in 2 weeks. It’s a small townhouse, and all but 2 of the 20-something invitees have said they’ll be here. Yikes! Two years ago, Janeites celebrated the 200th birthday of S&S, and this year we are celebrating P&P. Yes, today marks 200 years since P&P was first published. The book had been rejected by a publisher in the late 1790s, but a much smarter publisher accepted it for publication on January 28, 1813. And the world is a better place as a result. I have been listening to the “readathon” at the Jane Austen Centre website. It’s been a lot of fun listening to each chapter as read by a different person. It was supposed to go from 11 a.m. — 11 p.m. GMT, but it’s now 1:30 a.m. GMT on the 29th and there are still at least 6 or 7 chapters left to go. Yes, I’m back. 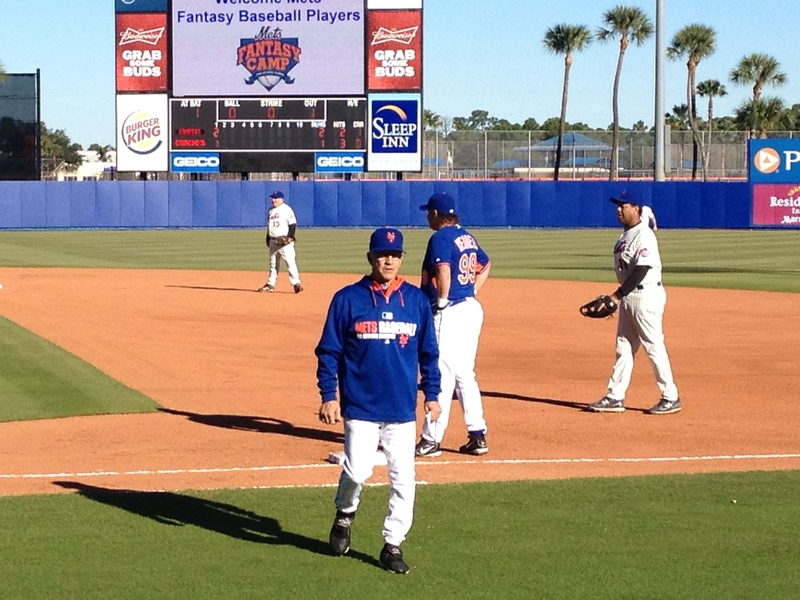 I’ll explain some of the reasons for the “hiatus” in another post, but for the time being, I’ll share what happened during my 3 days at Mets Fantasy Camp 2013. In 2011 and 2012, I only went for 1 night and was there for the awards dinner. Baboo had told me about how much fun the Kangaroo Court was, so this year I was able to get the day off from work and went for 2 nights. I left home at 5:45 (close to an hour later than I left the other 2 times) and, because the state and the various counties have been working to improve the road, the 135 miles didn’t take 3+ hours as it has done before. This time, it only took about 2 1/2. It doesn’t sound like a big difference, but it was. The road wasn’t quite as lonely and I wasn’t forced to follow so many slow-moving farm vehicles as much as I had in the past. 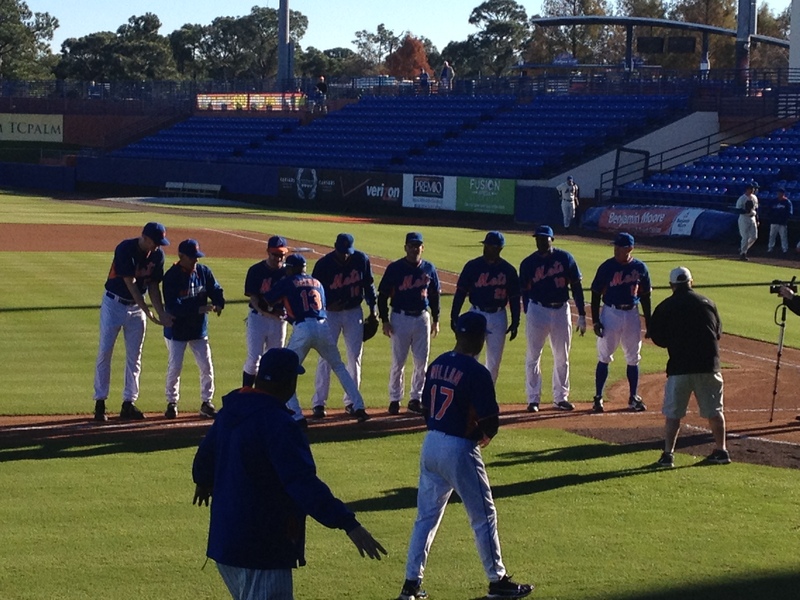 Unfortunately, not as many former Mets were on hand as there have been in years past. There were enough players for 10 teams — barely enough, as we found out — but there were 2 more teams this year than last. 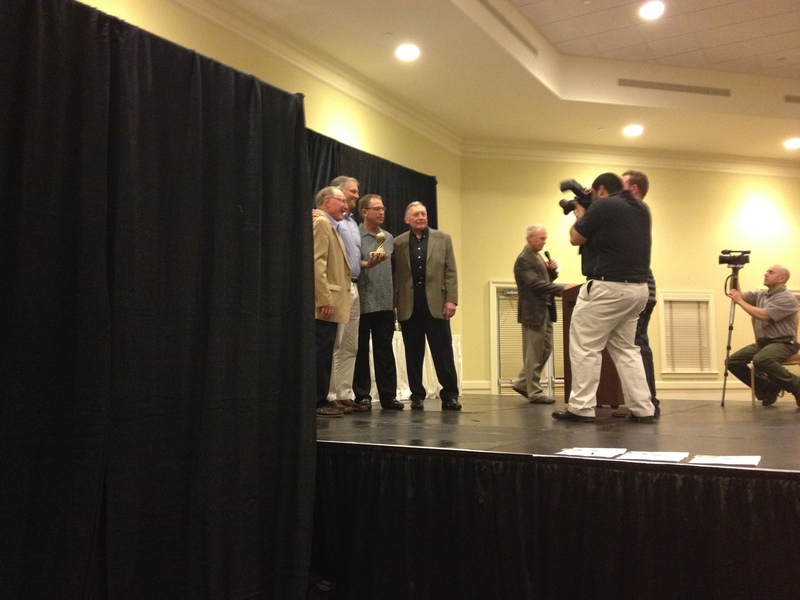 Baboo’s team was called Guys & Dolls and the coaches were Ron Swoboda and Guy Conti. 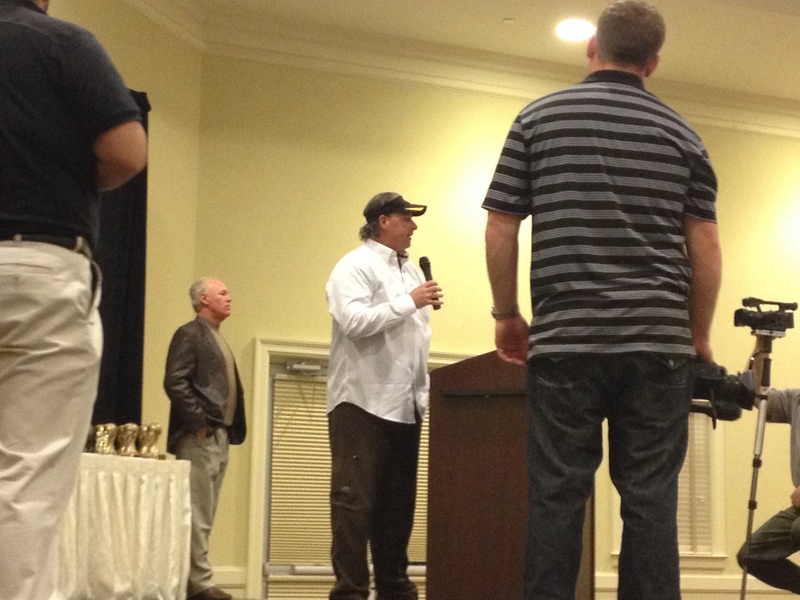 I arrived in time for the morning meeting, and heard the nominations for the brown and gold ropes. As a reminder, the brown rope is awarded to the player who made the most spectacularly boneheaded play of the previous day, and the gold rope is awarded to the player who made the most spectacular play, period. On Friday however, the brown rope winner was not a player. The winner was Rodney McCray (known as Crash — here’s why) in honor of the truly dumb instructions he gave a player on his team. On Saturday, the only 2 women in camp swept the awards. It was the first time ever that both awards had been won by women. Obviously, nobody wants to win the brown rope, but it was still pretty neat to have the women up there in front of the audience. Unfortunately, Baboo’s team finished in 10th place, with a record of 1-6. 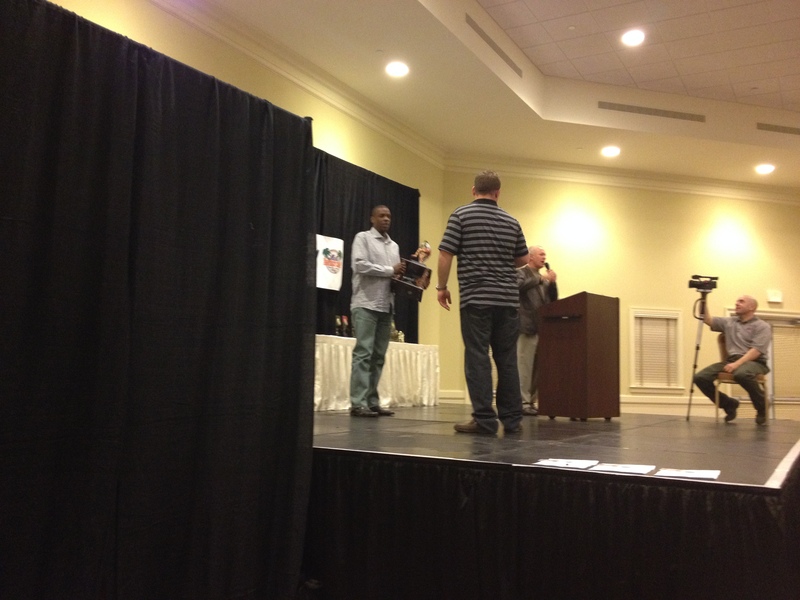 The winning team was coached by Eric Hillman and Rodney McCray. They beat Pete Schourek and Doug Flynn’s team in Saturday’s finals. 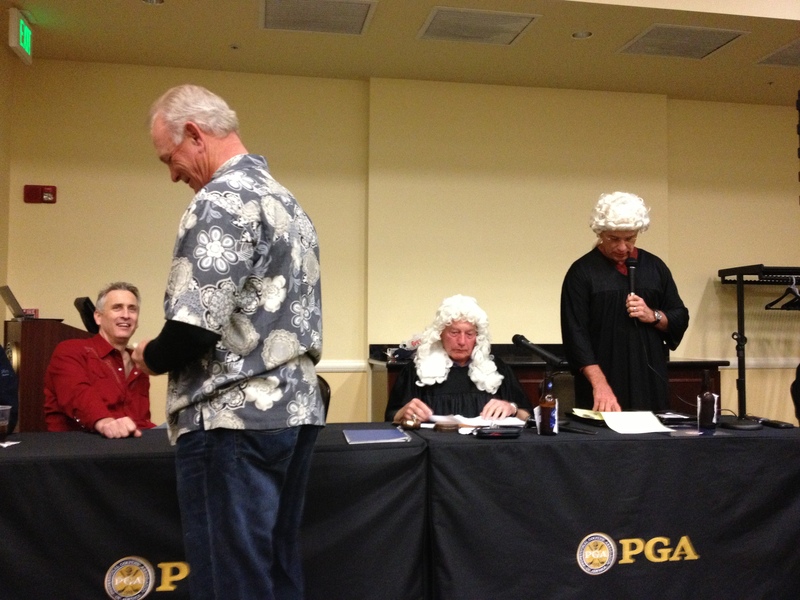 Bobby Wine acts as Judge and Doug Flynn is the prosecuting attorney at Friday night’s Kangaroo Court. Commissioner Stearns pays a fine while Eric Hillman laughs at him (as did we all). 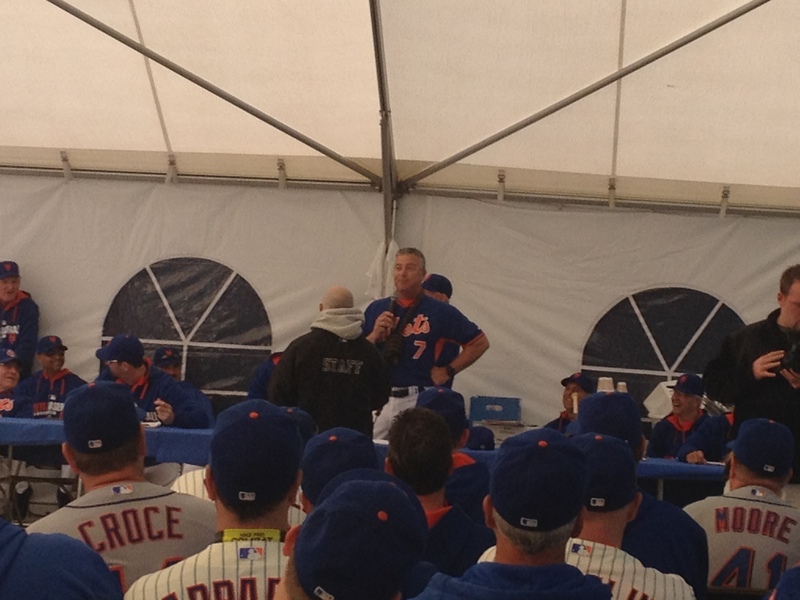 Commissioner Stearns speaks to the campers at Saturday morning’s meeting. AY (Anthony Young) sits next to Lenny Harris. In back are Crash McCray and Pete Schourek. To our right is Felix Millan. 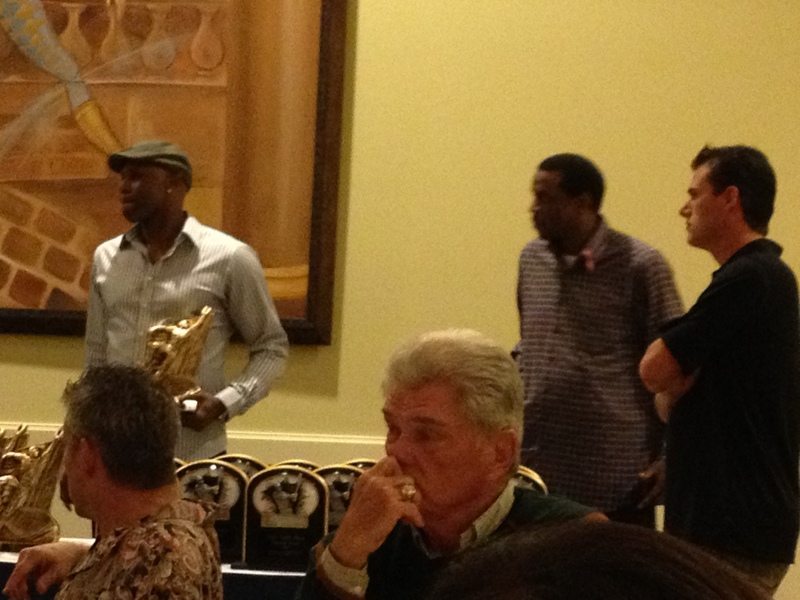 Cliff Floyd and Doc Gooden present an award on Saturday night. 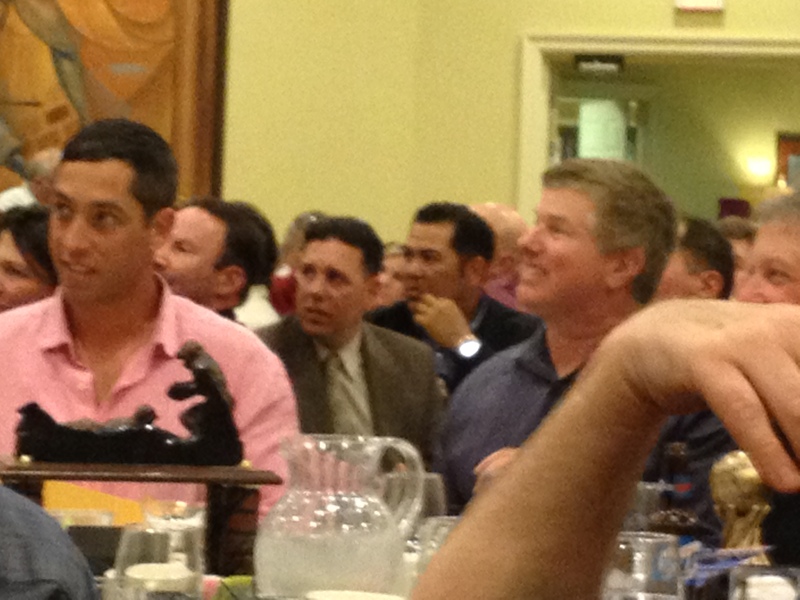 Eric Hillman, Duffy Dyer and Joe Pignatano at the Awards Dinner. Randy “Nemo” Niemann and Ed Charles (once again wearing the World’s Greatest Jacket — see last year’s report for the close-up). Representatives of the ’86 World Series team (Wally Backman, Tim Teufel, Randy Niemann and Doc Gooden) as a statement from Sandy Carter is read. All proceeds from the Kangaroo Court went to the Gary Carter Foundation. Even people who weren’t fined donated to the cause. 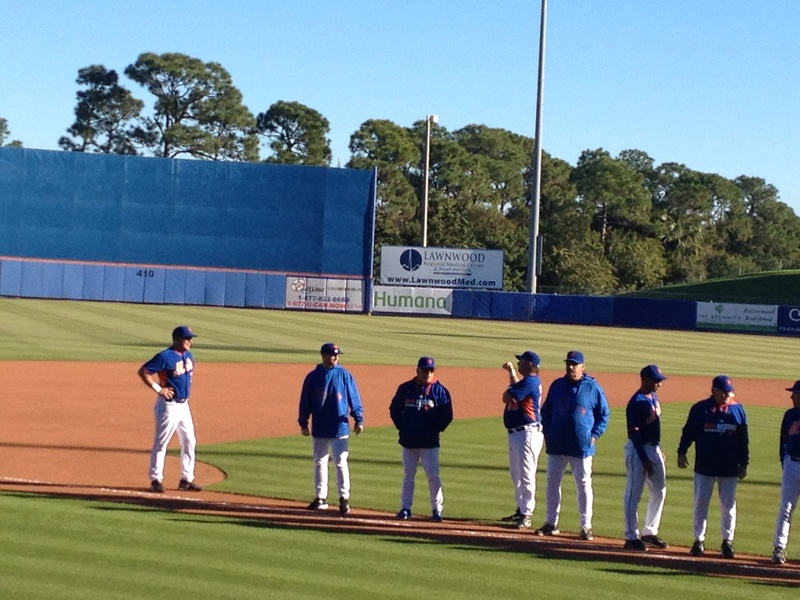 As some of you may not know, the last day of camp features games at the Mets’ spring training stadium where the pros play the campers in order of how the campers finished in the standings. 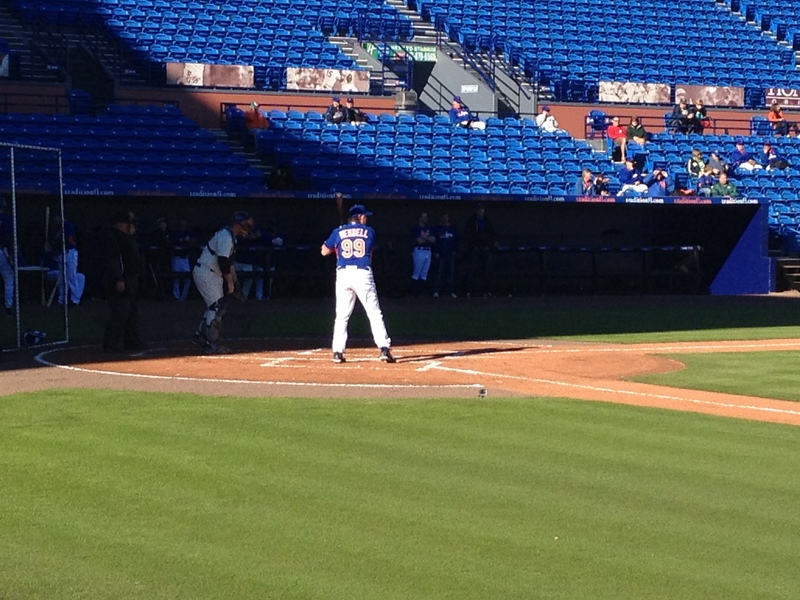 Here is Doc Gooden preparing to bat in one of those games. He did not pitch. 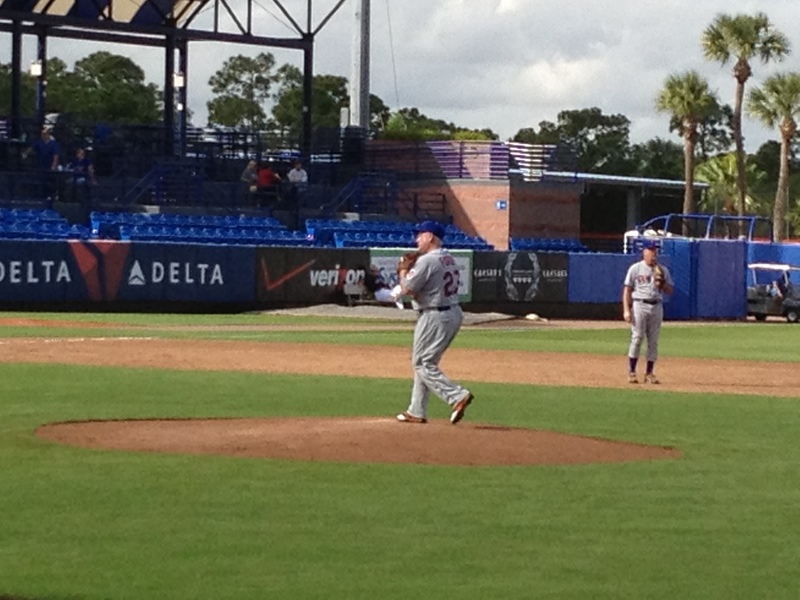 But we did see AY, Pete Schourek and even Kevin Baez on the mound. 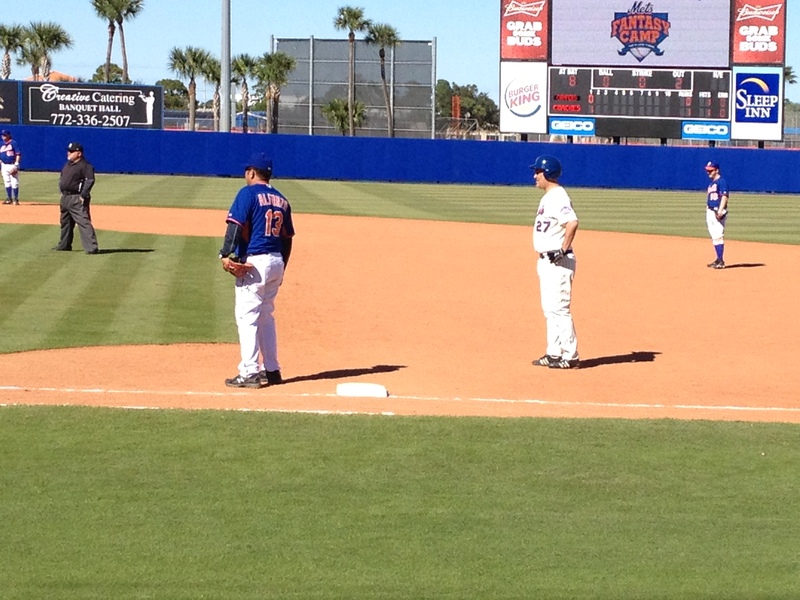 The Great Baboo makes it to first; Eric Hillman is supposedly guarding the line. Baboo is versatile. He pitches too. As I told Baboo, if I am invited again next year, I will be there. It’s some of the most fun I have all year. If you live in Florida, the Sunday games are open to the public. The concession stands are closed, but the team store is open so you can pick up swag. I can almost guarantee you’ll have a blast. Downton Abbey returned to the British airwaves last night. Episode 3.1 was, in my not-so-humble opinion, rather interesting and I liked it. Yes, even Shirley MacLaine. The episode begins in 1920, just before Mary and Matthew’s wedding. The household is in a tizzy getting ready, but Robert is called away to London to speak with the people who oversee his investments. It appears that he made some very bad decisions during the war, and invested a huge amount of money in a railroad company that is now about to go bankrupt. As a result, he’s lost most of his and Cora’s money. He tells Cora and Mary (who, of course, tells Matthew), but nobody else in the household knows anything. It should be interesting to see how Robert and Cora manage without all that money going forward. I wonder if Martha will do something for them. Edith needs to marry Sir Anthony soon so that they won’t need to continue supporting her anymore. And how will Violet react to there being no money? That should be interesting, to say the least! So Mary and Matthew do manage to get married. Obviously, it won’t go completely smoothly (otherwise they could end the entire thing now! ), but they’ve at least crossed one hurdle. I am looking forward to seeing what happens with Mr. Swire’s money. Shallowness alert — how Bates manages to look adorable even in his prison uni is beyond me, but he does. And poor Anna — all those ideas for how to get him out. My heart really goes out to her. Bates’s cellmate is rather creepy, and, of course, I think something will happen because of this. Another plot element that could be interesting is seeing O’Brien and Thomas’s relationship fade away. She has Alfred (her nephew, who’s been hired as a footman) to focus on now, and you can see that Thomas is more than slightly resentful. I honestly don’t think he’s smart enough to plot on his own, so this could definitely be interesting going forward. Sibyl and Branson, er, Tom come over from Dublin. At first, nobody knows who sent the money, but then we find out it’s Violet. It’s rather fitting, but also somewhat surprising. As an aside, here is the press pack from ITV. I see that Lady Rosamund (Samantha Bond) will appear in the series. I’d heard that she might have left the show. OK. That’s my take. What about yours? Pride and Prejudice: A Latter-Day Comedy is on sale. Just over 2 years ago, I reviewed Pride and Prejudice: A Latter-Day Comedy. It’s a movie I really like, and I watch it periodically because I do find it to be so entertaining. I bought my copy from an LDS (Mormon) website and, as a result, I get emails and other promotions from that site to this day. That site, DeseretBook.com, sent me an email this morning offering me the chance to buy the movie at the price of $9.99. The email said that this price is good for today only (but the website itself doesn’t say that), and that it won’t ship for a couple of weeks. But this movie is hard to find, so I wanted to make sure that everyone who wants a copy is able to order one for their own collection. Good luck and, if you do buy a copy, please let me know whether or not you liked it. Updated July 22, 2012: the movie now costs $12.99. It’s still less than the list price of $19.99 and less than Amazon’s price of $17.01. First class (not) all the way. I just got back from a vacation to Los Angeles. We had a family function out there and I was very, very happy to go. But, when I first made my reservations, gas was averaging around $4 per gallon, and the airlines wanted far more money than I was willing (and able) to pay. So, I decided to use some of my saved-up miles. I had around 60,000 of them in my account, so I planned on using 25,000 of them on round-trip coach seats. Alas, it was not to be. My dates were not flexible in the slightest so, when I realized that there were no steerage, er, coach seats available, I found myself making the reservation for first class tickets at 50,000 miles for a round trip. Ouch. Anyway, the last (and only) time I flew in first or business class was in 1998, when I was upgraded on the red eye home from San Francisco because they needed my coach seat for someone else. It was a lovely experience featuring wider seats, better food and the opportunity for an actual nap (normally, I cannot sleep on planes). But my flight to LA this year was so much better. The plane I was on is, apparently, used regularly for international travel, and it was the nicest flight I have ever been on. The seat was in a sort of pod, and it had the ability to flatten out to 180 degrees so the passenger can take a real nap. We were delayed in Florida by thunderstorms for over an hour, so I got to watch 2 movies on the flight AND take a 2-hour nap. The food was very good and, even though I slept through the chocolate chip cookies, the flight attendant made sure I got some before we deplaned. It was a truly memorable flight. If I’d had the money to pay for this flight, I’d have paid for it in a heartbeat. The way home was, however, a totally different story. I spent 5 hours in a seat that was not much wider than that in coach. The food was ordinary (the menu said “breakfast quesadilla,” yet I was served Rice Krispies), the flight attendants bordered on surly (not quite as surly as your average coach flight attendants, but definitely worse than the flight attendants from the flight out to LA) and the only movie available was “The Lorax.” The seat itself was better than what one gets in coach, to be sure, but overall, if I’d paid full price for this flight I would not have been happy that it cost the same as the first one. As for the movies available to me on the way to LA, it was a tough choice. I ended up watching 2 — The Best Exotic Marigold Hotel and Midnight in Paris. I thoroughly enjoyed both of them. Best Exotic Marigold Hotel had a lot to live up to since I cannot imagine a movie with Judi Dench, Maggie Smith, Bill Nighy, Tom Wilkinson, Celia Imrie and Penelope Wilton being anything but wonderful. Yes, I did guess some of the plot twists, but I still loved it. When it comes out on DVD, I will definitely watch it again. Midnight in Paris was terrific. I admit I was leery about a movie starring Owen Wilson, but I really did like the movie. I loved Woody Allen’s early work, but his more recent movies have left me cold. But Midnight in Paris was just wonderful. The premise, that a 21st-century American man travels back in time to 1920s Paris, could have been weird, but this was not. We get to meet Hemingway, the Fitzgeralds, Picasso, Dalí, Toulouse-Lautrec, etc., etc., etc. Yes, some suspension of disbelief is required, but I had no trouble accepting the story as presented. It’s already on my Netflix queue and I am genuinely looking forward to seeing it again.